Each year, our Woodinville Chamber partners with our non-profit entities and members to look for ways to GIVE BACK to our community. 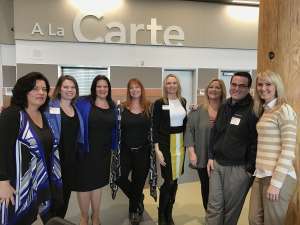 Here are a few of the ways in which we have attended and supported non-profit events, helped members to partner with our charitable members, and encouraged members to do so, as well! 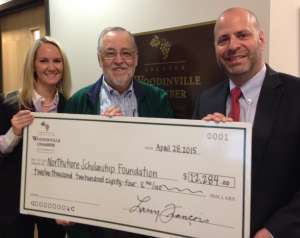 From 2012 – 2017, our Salute Woodinville guests ‘raised their paddles’ to donate over $50,000 to increase the Chamber’s endowment through the Scholarship Foundation of Northshore. Each year, our Woodinville Chamber selects a student to receive a $2,000 scholarship. The scholarship is provided by the Woodinville Chamber as an investment in the future business leaders, entrepreneurs and innovators of our community. Learn about our Woodinville Chamber Business Scholarship HERE. Each year, members of the Woodinville Chamber attend and support the Northshore Schools Foundation luncheon. The Northshore Schools Foundation raises funds and builds partnerships to fill in gaps in support of District priorities for educational success and excellence for all Northshore students, teachers and staff. To donate directly to the Northshore Schools Foundation, click HERE. 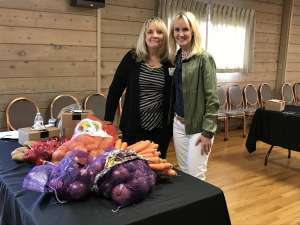 Our May 2017 Luncheon benefited the Woodinville Storehouse Food Bank with all produce from the event being donated directly to the Food Bank. At our October 2017 Business After Hours, NW Trophy & Award partnered with the Woodinville Storehouse Food Bank, asking attendees to bring items to donate. If you’d like to get involved with the Woodinville Storehouse Food Bank, click HERE. At our October 2016 Business After Hours, Expressions in Eyewear partnered with the Woodinville Lions Club to collect used eyeglasses from members who attended the event. Those glasses were then donated to people in-need in our community. 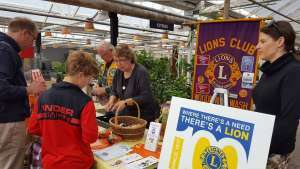 To learn more about the Woodinville Lions Club, click HERE. 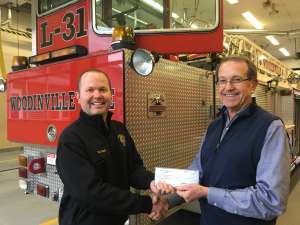 At our November 2016, 2017, and 2018 Luncheons, all proceeds from ticket sales were donated to the Woodinville Firefighters Benevolent Foundation, with $4,200+ benefiting the Shop-With-A-Cop Program. To donate to this program, click HERE. Our December 2016 Business After Hours benefited the YMCA Holiday Harvest Meal Program. Chamber members and the community brought in a tremendous amount of food to this month’s Chamber After Hours at the Pizza Coop & Ale House. The YMCA’s Holiday Harvest Meal Program provide foods for local families in need during the holiday season. For more information about the Northshore YMCA, click HERE.